Do you need your printing urgently? We offer high quality printing with an incredible Next Day Delivery, and we mean next day delivery. All orders placed before 1pm will be despatched the same day for NEXT DAY delivery to mainland UK. This excludes Scottish Highlands and UK Islands. Any orders from non-mainland UK customers will carry an additional delivery cost, and are likely to take longer to deliver; in most cases an additional day is required. Please contact us for details prior to placing your order. Orders placed after 1pm weekdays may fall into the following days production and therefore will be delivered within 48 hours. Do you need a larger quantity? 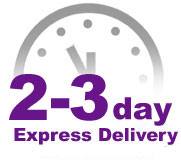 We offer an even quicker express delivery of 2-3 days. These delivery times are based on us receiving your order and ‘print ready’ artwork by 4pm of any weekday. If you require us to produce, design or alter your artwork then this will take time and will add to the delivery schedule. Therefore the specified delivery schedule will commence from the time the artwork is approved and therefore classed as ‘ready to print’. If you are unsure if we can meet your delivery schedule, please call us and we’ll be happy to try and help you out.